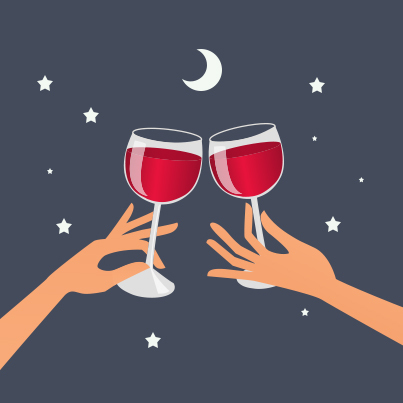 Dr. Richard J. Stuart Blog: Just Another Reason To Drink Wine! Wine lovers everywhere, rejoice! Already known for its health benefits, research shows red wine protects against cavities, too! A recent study published in the Journal of Agricultural and Food Chemistry explores the effect a selection of red wines and grape-seed extract has on communities of disease-causing bacteria, called biofilms. Biofilms erode the teeth causing gum disease. Gum disease is a result of the build up of plaque and tartar on the teeth, and in the soft tissue of the gums – pockets of infection cause inflammation and discomfort and pain. But some treatments can be abrasive, and side effects of some mouthwashes include discoloration of the gums, and altering taste. In order to understand how effective red wine is in preventing the growth of biofilm, researchers developed a biofilm model of plaque that combined five types of bacteria most commonly found in gum disease and tooth decay. The biofilm cultures were then dipped in numerous varieties of wine – with and without alcohol – for a couple of minutes. The results showed that all red wine and red wine containing grape seed extract were more likely to get rid of the bacteria. Of course, the study wasn't designed with excessive drinking in mind; everything in moderation! Rather, as the researchers said, "these findings contribute to existing knowledge about the beneficial effect of red wines (one of the most important products of agriculture and food industries) on human health." We'll drink to that – cheers!